Vincent Franceschi, P.E., has joined PSI as an executive vice president overseeing PSI’s offices in western states. He has led engineering services, environmental consulting, and analytical laboratory services companies. His core market sector experience has been strongly related to the electric power, nuclear, oil and gas (pipeline), DOE, and local municipal waste/landfill agencies. Before joining PSI, he was involved in leading Exponent, Evans Analytical Group, ENV America, EMCON, and ABB Impell. Franceschi earned his Bachelor of Science in Civil Engineering from the University of California at Berkeley and his MBA from St. Mary’s College. He will be based in PSI’s Oakland operations office. Professional Service Industries (PSI) (www.psiusa.com) is a consulting engineering and testing firm. PSI provides a range of environmental engineering and testing services, including environmental consulting, geotechnical engineering, construction materials testing and engineering, industrial hygiene services, facilities and roof consulting, and specialty engineering and testing services. Headquartered in Oakbrook Terrace, IL, a Chicago suburb, PSI operates from 100 offices in North America with more than 2,000 employees. Washington Marriott Marquis Hotel, Washington D.C.
GEI provided environmental, geotechnical, and construction services for the new $520 million, 105,000-square-foot Washington Marriott Marquis Hotel in Washington, D.C., set to be completed in May 2014. Services provided included environmental site investigation, soil pre-characterization, value engineering of the foundation system, design of deep drilled shafts for the top down construction scheme, and field oversight during foundation construction. For this project, seven below-grade stories were constructed that required the installation of drilled shaft foundations and interior building columns at depths of more than 100 feet below ground. A top-down construction technique was used, a method that builds the permanent structure members of the basement along with the excavation from the top to the bottom. The four-star Washington Marriott Marquis Hotel was designed to earn LEED Silver certification and will be one of the largest hotels in the country to earn this achievement. GEI designed the foundation system to help accelerate the construction schedule while saving costs and fulfilling project requirements. Washington D.C. Water Clean Rivers Project, Blue Plains Tunnel, Washington D.C.
GEI is providing geotechnical consultation and field services to the consultant construction management team (CCM) for the $330 million Blue Plains Tunnel design-build project in Washington, D.C. The CCM team is managed by EPC consultants and consists of site-specific engineering consultants. D.C. Water is in the process of constructing a 24,000-foot-long soft ground tunnel, the first and largest in a network of tunnels that will capture and convey the combined sewer overflow (CSO) that currently impacts the health of the rivers in Washington, D.C. GEI’s services include geotechnical consultation, instrumentation submittal and design reviews, a variety of construction oversight services, and geotechnical data management services. When the tunneling work begins at the end of this year, GEI will provide oversight of the instrumentation system, which will measure ground movement along the tunnel alignment and at four major shaft sites during construction. The firm also contributed design review and field inspection services during the construction of slurry walls, which ensure that construction upholds the design tolerance for the excavation support. GEI has completed work as the technical lead and quality control representative for the Judy Company (TJC) on the $10 million Wolf Creek Dam Gallery and Plaza Grouting rehabilitation project. The Wolf Creek Dam project is the most critical structure in the U.S. Army Corps of Engineers’ national inventory of dams. The project involved installing grout curtains in the gallery and plaza areas of the dam. During the project, GEI also focused on safeguarding the local ecosystem, including the quality of the water feeding into the nearby Wolf Creek Fish Hatchery. Century Engineering welcomes Thomas Hicks, P.E. as the director of business development for its Transportation Division. Hicks will service clients throughout the Mid-Atlantic region and ensures Century’s commitment to providing traffic engineering solutions to guide and assist our government and commercial clients addressing traffic safety, engineering design, planning, and operational issues. Hicks is a Maryland Registered Civil Engineer with a BSCE from the University of Maryland, and he completed the graduate school program of the Bureau of Highway Traffic at Yale University. Hicks taught traffic engineering for three years at the University of Oklahoma, and he was a guest lecturer and mentor in the Advanced Transportation Operations Program at the Texas Institute of Texas A&M University for five years. He also served as the state traffic engineer for the Maryland State Highway since 1968, and under the old State Roads Commission, he served as assistant chief engineer for traffic safety, later assistant chief engineer, and finally in 1991, his position was elevated to deputy chief engineer. Century Engineering is a multidisciplinary engineering firm providing a range of engineering, surveying, and construction inspection services to government agencies and various industries throughout the Mid-Atlantic region. Century is headquartered in Hunt Valley, Maryland with offices in Delaware and Pennsylvania. At a recent ribbon-cutting ceremony, Merrick-McLaughlin Whitewater Design Group (M-MWDG) was recognized after providing hydraulic engineering expertise for design of the first known combined state-of-the-art fish passage and recreational whitewater facility in the United States. The project is located adjacent to an existing diversion dam on the Gunnison River near Delta, Colorado. The scope of work includes removal of a vertical drop at the dam and design and installation of hydraulically connected but independent channels to enable both fish passage and boat passage. The fish passage facility design allows native Colorado endangered fish to negotiate the diversion dam, promoting recovery of these species. The boat passage channel provides a high-performance recreational experience for river enthusiasts and boaters. Owned by the Hartland Irrigation Company, the existing dam was constructed in 1881 as a 6-foot high vertical structure to divert water to their canal. As originally constructed, the vertical dam did not allow upstream and downstream movement of fish and also prevented upstream and downstream navigation by boaters. The irrigation company and the Painted Sky Resource Conservation & Development Council (District) wanted these issues resolved and selected M-MWDG to provide engineering services to accomplish this mission. The project includes a multi-slot baffled fishway that orients weak swimming fish upstream and is hydraulically efficient in allowing passage of target species in a much shorter and less costly channel. This design also reduces debris accumulation and is a much lower hazard to boaters and river enthusiasts. The fish passage facility extends the upstream range of the Colorado native endangered fish by approximately 15 miles, which re-establishes and maintains the endangered fish population and improves the overall ecosystem health of the river. M-MWDG served as engineering consultant and provided multi-dimensional computer modeling, hydraulic analysis, alternative evaluation, design engineering, plan preparation, cost estimating, and construction phase support for the project while working closely with the U.S. Fish and Wildlife Service (USFWS). For more information, visit www.merrick.com. The Institute for Sustainable Energy and the Environment (ISEE), a research center at Ohio University's Russ College of Engineering and Technology, was recently awarded a $1.9 million, four-year grant by the National Science Foundation to address alternative energy needs for future development of sustainable buildings. The project, "Sustainable Housing through Holistic Waste Stream Management and Algal Cultivation," aims to develop the fundamental information needed for designing, constructing, optimizing, and scaling up an algae-based power system to support the energy requirements and waste stream management of houses or residential communities. Ben Stuart, ISEE director, associate professor of civil engineering, and principal investigator of the project, explains that currently, "off-grid" housing is often limited to using solar PV arrays and wind power for meeting electricity demands and solar thermal or ground-source geothermal for heating and cooling. And he adds that much of the current biofuels research is targeted toward transportation. "In contrast, this project seeks to extend biofuels applications to residential housing by using water and solid waste streams and applying carbon and nutrient recycling in the production of feedstocks for fuels, feed, and food. This will promote sustainable, off-grid housing, including holistic management of natural resources with minimal environmental impact." The project is being supported by the NSF's Sustainable Energy Pathways (SEP) Program, part of a larger NSF initiative on "Science, Engineering and Education for Sustainability." The SEP calls for innovative, interdisciplinary basic research in science, engineering, and education by teams of researchers developing systems approaches to sustainable energy based on a comprehensive view of the scientific, technical, environmental, economic, and societal issues. According to Stuart, Associate Professor of Civil Engineering Guy Riefler and Assistant Professor of Economics Ariaster Chimeli will combine lab studies with advanced process modeling software to assess public acceptance and determine economic risks. "Our partners at Georgia Tech, led by Dr. Daniel Castro, will then use this information to develop scenarios for architectural design and construction in single residences, neighborhoods, and extended communities." Stuart has a long track record in alternative fuels research, including work with ECO2Capture, a local company currently housed at OHIO's Innovation Center developing and demonstrating a polymer membrane system that can significantly increase algal growth for use in the CO2 capture and biofuel markets. An economically feasible way to store solar energy in existing residential power networks is the subject of an award-winning paper written by two Virginia Tech electrical engineers and presented at an international conference. Reza Arghandeh of Blacksburg, VA, a doctoral candidate in the Bradley Department of Electrical and Computer Engineering at Virginia Tech, won the best student paper award at the 20th International Conference on Nuclear Engineering, held in conjunction with the American Society of Mechanical Engineering Power 2012 in Anaheim, CA. His advisor is Robert Broadwater, professor of electrical and computer engineering, who specializes in electric power system analysis and design. In their paper, they acknowledge that solar energy resources are "intermittent, seasonal, and non-dispatchable." However, the current national climate with its deregulation policies, electricity tariffs, control strategies, and demand management are "significant tools for flexible and resilient operation of power systems with photovoltaic adoption levels," Arghandeh argues. "Selling the household generated electricity into the electric energy market and the storage of electricity in storage systems and demand control systems provide a variety of economic opportunities for customers and utility companies to use more renewable resources," he adds. Some residential houses are already doing just this -- selling power back to an electrical distribution industry. But Arghandeh and Broadwater's work provides an optimization algorithm for a distributed energy storage (DES) system on a broad scale. The system they developed presents a fleet of batteries connected to distribution transformers. The storage system can then be used for withholding distributed photovoltaic power before it is bid to market, Arghandeh explains. "Withholding distributed photovoltaic power, probably gained from rooftop panels, represents a gaming method to realize higher revenues due to the time varying cost of electricity." Arghandeh is referring to the peak usage of energy systems such as the early evening hours when families return home from school and from work versus the low-usage times that occur in the early morning hours when most households are asleep. "The distributed photovoltaic power adoption can be controlled with the help of real-time electricity price and load profile," he confirmed. Today's power systems are moving towards a smart grid concept to improve their efficiencies, reliability, economics, and sustainability. Arhhandeh and Broadwater want to make sure that solar technologies are integrated with the existing technologies like energy storage and control systems. Specifically, the distributed energy storage system computation they devised is called a discrete ascent optimal programming approach. It insures convergence of the various power systems after a finite number of computational iterations. A solution determined by using their approach depends upon the day-ahead forecast of load variation, market prices, and photovoltaic generation. The output of their optimization algorithm is a distributed energy storage charging and discharging schedule with maximized operation benefits. Electrical Distribution Design (EDD) of Blacksburg, VA, a software company serving the utility industry, funded this research. WSP SELLS announces that Brian Doherty, P.E. has joined the firm in its Albany, NY office. Doherty has 38 years of experience in transportation design work, most recently as design manager of the Major Projects Group for the New York State Department of Transportation (NYSDOT) Region 8 in Poughkeepsie, NY. As the Transportation Department manager of the Albany office, Mr. Doherty will lead WSP SELLS’ growth in the region and support the the office by expanding and enhancing the civil, municipal, and transportation teams. Doherty received his Bachelors of Science in Civil Engineering from The University of Massachusetts (UMass), Lowell. He is a registered Professional Engineer (P.E.) in New York and Massachusetts. Through its combination with GENIVAR, WSP SELLS is a professional services firm working with governments, businesses, architects, and planners providing integrated solutions across many disciplines. The firm provides services to transform the built environment and restore the natural environment, and its expertise ranges from environmental remediation to urban planning, from engineering iconic buildings to designing sustainable transportation networks, and from developing the energy sources of the future to enabling new ways of extracting essential resources. It has 14,500 employees, including engineers, planners, project managers, technicians, environmental experts, and other specialists based in more than 300 offices across 35 countries on every continent. of the economic recession and an increase in the outsourcing of these types of jobs. However, there are still hundreds of thousands of manufacturing jobs available throughout the nation, and many top employers are having trouble finding skilled workers to fill those positions. According to the job site AmericanMFGjobs.com, some of the most popular manufacturing jobs available are for assemblers, engineers, CNC specialists and managers. Certain states are hiring more manufacturing employees than others. Aside from the largest states, those in the Midwest that are historically known as manufacturing hubs are looking to rebuild that reputation. since 2010 after several years of a decline in the manufacturing industry. Dewberry has become part of a public-private team exploring community adaptation to climate change risks in a new demonstration project funded by Mid-Atlantic Sea Grant. Known as the Community Adaptation to Sea-Level Rise and Inundation (CASI) Research Partnership, the team consists of George Mason University, Dewberry, the U.S. Naval Academy, and the Center for the Study of Local Issues at Anne Arundel Community College. The demonstration project, known as the Future Coast initiative, is being conducted in Anne Arundel County, MD. The research focuses on how public education, through visualization of impacts and citizens’ deliberation, can enhance long-term community resilience by stimulating consideration of actions and policies to minimize risk. Anne Arundel County, which has from 2,200 to 6,900 acres of shoreline threatened by inundation from sea-level rise, is at the forefront of coastal communities in using LiDAR elevation data to assess sea-level rise vulnerability and inform adaptation decision-making. The CASI initiative seeks to demonstrate an effective and replicable framework for communicating sea-level rise impact data to individual residents and facilitating public deliberation that will lead to policies to support long-term resilience. Dewberry’s role in the initiative includes producing projected geospatial coverages of inundation for a number of timeframes and scenarios, including calculations of change in the probability of flooding, identifying properties likely to be affected by projected inundation, and identifying risk. The firm also developed a web toolkit and geospatial data portal that enables residents to use an address locator service and visualize impact data, including the temporal evolution of impacts at their property, with summaries on impacts in the neighborhood and in the county. The site summarizes risks for queried properties and allows individuals and groups to compare their opinions to those of other county residents before and after they conduct their own deliberations. The citizens’ deliberation component includes surveying event participants before and after access to the information and serves as a guide to what information the public finds most valuable. Mid-Atlantic Sea Grant focuses on the sustainability and viability of coastal communities and marine ecosystems through natural and social science research, outreach, and communications activities. Funding for the CASI project comes from the National Oceanic and Atmospheric Administration (NOAA), administered through Virginia Sea Grant. Dewberry provides architecture, engineering, and management and consulting services to a wide variety of public- and private-sector clients. Dewberry is headquartered in Fairfax, Virginia, with more than 40 locations and 1,800+ professionals nationwide. To learn more, visit www.dewberry.com. Axion International Holdings, which uses recycled plastic and plastic composite technologies to produce ECOTRAX rail ties and STRUXURE building products, announced that the international engineering and construction firm Parsons Brinckerhoff has completed a Standard Design Guide of Thermoplastic Bridges for three short-span heavy-load bridge applications using Axion’s Recycled Structural Composite (RSC) products. The guide is intended to help engineers and developers understand the structural details and capabilities of Axion’s RSC as they enter into the design phase of short-span bridges using Axion’s STRUXURE construction systems as alternatives to legacy materials. The guide is available on the Axion website for registered engineers and designers at www.axih.com to use when they’re initiating projects. Axion’s products have proven successful for bridge applications ranging from light pedestrian traffic to 120-plus-ton railroad locomotives. Most recently Axion’s RSC was used in the construction of an automotive bridge crossing the York River outside of York, Maine, which opened for traffic in January 2012. Axion’s STRUXURE building materials were created as a sustainable alternative to legacy building materials like wood, steel, and concrete. STRUXURE Construction Systems provide excellent structural performance, offer lower lifecycle costs (including competitive first-time installation costs and lower maintenance costs) and tangible superiority in terms of sustainability. STRUXURE is a more durable, longer lasting, environmentally sound and lighter heavy-load building material, and it is fully recyclable at the end of its lifecycle. Construction costs can be lowered and maintenance costs can be virtually eliminated. Components can be prefabricated by Axion and shipped to installation sites for quick application. Parsons Brinckerhoff develops and operates infrastructure around the world with 14,000 employees serving clients and communities in the Americas, Europe, Africa, the Middle East, Asia and Australia-Pacific regions. The firm offers skills and resources in strategic consulting, planning, engineering, program/construction management, and operations for transportation, power, mining, water/wastewater, and community development projects. Parsons Brinckerhoff is part of Balfour Beatty, an international infrastructure services business operating in professional services, construction services, support services, and infrastructure investments (www.pbworld.com). The U.S. Navy has exercised an option authorizing Advantech to continue implementing a contract providing a dozen hospital construction experts to augment Navy staff as part of the new $451 million naval hospital at Marine Corps Base Camp Pendleton in San Diego, CA. Jack Fraser, P.E., Advantech president/CEO, made the announcement. The stimulus hospital project, the largest the Navy has under the 2009 American Recovery and Reinvestment Act, will replace the current hospital, built in 1974. Thousands of engineers, construction workers, architects, and military and civilian contractors have contributed to the project which recently passed the halfway mark. Lessons learned from other projects have also guided current success. "The Naval Facilities Engineering Command Southwest team extensively researched lessons learned from over 20 hospital visits, to include the new Walter Reed National Military Medical Center (Maryland), Fort Belvoir Community Hospital (Virginia), Palomar Pomerado Hospital (California), Las Vegas VA (Nevada), and both the UCSD and UCLA hospitals in California. The choice to augment the Navy field team with contracted expertise was a clear step in the right direction to provide flexibility and specific skill sets when needed while providing proficiencies in areas that NAVFAC normally does not possess. The composite organization now provides a blended team of employees familiar with NAVFAC business procedures, Camp Pendleton-specific organizational knowledge, hospital construction and design, medical gas, hospital commissioning, and proficiency in OSHPD certification for California. Although not required to be OSHPD certified, many aspects of the hospital design were required to meet the stringent requirements of the California safety code for seismic design," says Commander Whit Robinson, NAVFAC Southwest Resident Officer in Charge of Construction (ROICC), Replacement Naval Hospital Camp Pendleton. The new facility, expected to open in 2014, will feature open spaces for natural light and includes a central atrium. There will also be a reflection and meditation area that will have a wall inscribed with the names of Medal of Honor recipients. 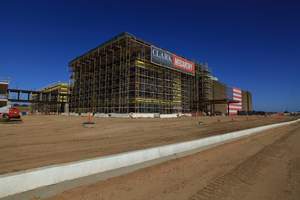 The new hospital is part of a 70-acre site that will also have a central utilities plant, a 1,500-space multi-level parking structure, 1,500 outside surface parking spaces, and associated supporting facilities. According to Fraser, his staff has been coordinating with the Navy since February; they consist of professional engineers, inspectors, technicians (including medical gas inspectors), and safety professionals. Advantech continues to provide civil/electrical/mechanical/structural engineering services as well as architecture and interior design consultation. The staff augmentation consists of 12 professionals overall to support the ROICC at Camp Pendleton. NAVFAC is the Systems Command that delivers and maintains facilities, acquires and manages capabilities for the Navy's expeditionary combat forces, provides contingency engineering response, and enables energy security and environmental stewardship. Advantech GS Enterprises (www.agse.us) is a San Diego-based multidisciplinary Service Disabled Veteran-Owned Small Business (SDVOSB) company providing engineering, environmental and construction management, construction materials testing, and staff augmentation services to support government requirements. Advantech is certified as a HUBZone Small Business by the Small Business Administration and as a Disabled Veteran Business Enterprise (DVBE) and a Small Business Enterprise (SBE) by the State of California.